Poncirus trifoliata growing tree or shrub of the genus Poncirus also known as Trifoliate orange, Poncirus trifoliata grow as perennial deciduous used more as ornamental thorny plant, it can grow in tropical, subtropical, mediterranean or temperate climate and growing in hardiness zone 6+. Flower color white, flowers grow in clusters. Fruit size ~3-5 cm and color is yellow, the inner fruit divided by segments the segment cover with layer, the taste is sour remind lemon tree to bitter orange tree. Poncirus Trifoliata Flying Dragon Trifoliate Orange Tree 5 Seeds! 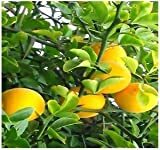 Poncirus trifoliata FLYING DRAGON HARDY TRIFOLIATE ORANGE Tree SEEDS! What can be done with big quantities of Trifoliate orange fruit?